The US banking environment is in a new, more unpredictable phase as we begin 2019. Economic growth continues to chug along nicely, poised to achieve a 3% plus GDP growth rate on an annual basis for the first time in many years. However, all major US stock indexes showed greatly increased volatility in 2018 after a long run of stable advances, and ended the year in the red for the first time since 2008. Based on the solid GDP performance, and sustained optimism from both consumers and businesses, the Federal Reserve bumped the Fed Funds rate up four times in 2018, seeking that elusive point of “neutrality”, where neither accommodation nor economic restriction dominate the economic landscape, and is now suggesting a pause in rate hikes for early 2019, until further economic data confirms whether the economy is stable, weakening, or improving. Unfortunately, the fourth quarter decline in stock values together with slowing in other non-US global economies, the ongoing US – China trade negotiations, lackluster inflation, and uncertainty regarding the Fed’s rate intentions for 2019, are all conspiring to flatten the US Treasury curve. As of the date of this writing (January 8, 2018) the curve includes a tiny bit of inversion between the one-year and three-year Treasuries, while maintaining just 17 basis points of positive slope between the bell-weather two and ten-year Treasuries. Some investors are concerned that further moves by the Fed might drive a fully inverted yield curve, normally considered a harbinger of recession 18 – 24 months out. How have these trends affected banks, and the prospects of lenders trying to grow their loan portfolios, while simultaneously maintaining or improving portfolio profitability? 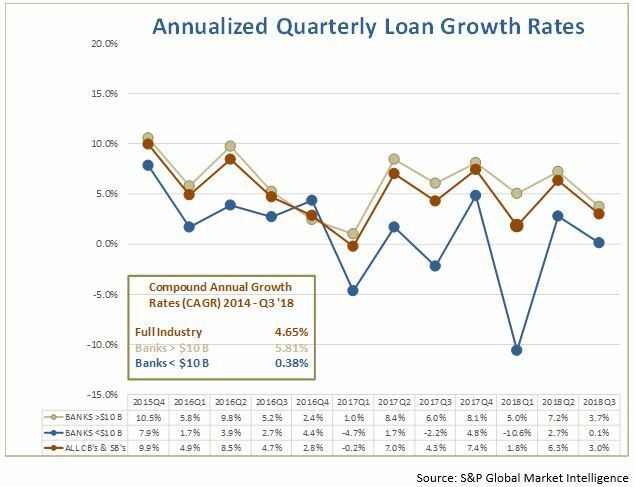 S&P Global Market Intelligence data through September 30th show that annualized quarterly loan growth rates for institutions less than $10 Billion in total assets has consistently lagged below the growth rate of the industry and that of institutions greater than $10 billion, over the last 12 quarters. Compound annual growth rates for smaller institutions averaged only 0.38% between 2014 and the end of the third quarter of 2018, while larger institutions grew at a 5.81% rate during this same period. The smaller institutions have also experienced greater volatility in loan growth from quarter to quarter. As a result, these community bank’s need for accurate pricing metrics is even greater, as a compensating control mechanism offsetting their natural desire to compete for increased loan volume based on price alone. So, within this environment, what are the risks and pitfalls that lenders should be striving to avoid, and what are the most prudent strategies to be implementing now? Imagine a scenario where over the next 18 – 24 months, a bank “successfully” gains loan market share by growing its loan portfolio more quickly than its market competitors. Recall that under current lending conditions, most institutions have been loosening credit underwriting standards, suggesting that, if this organization is successfully growing market share, it too must have relaxed its credit standards, (see OCC article included in this Newsletter). Given these projections, it would be entirely possible that this hypothetical bank is rapidly building a loan portfolio containing some lower credit quality loans, quite possibly leading into the next recession. If this were true, and a recession follows, say 18 – 24 months out, this institution is likely to incur much higher loan losses during the recession, and see its profitability fall at a quicker than normal rate. (We’ll leave for another day any discussion of how the required implementation of CECL, the new credit loss accounting standard might affect this hypothetical institution). Assuming you agree that something like the risks described above could occur, and that you would like to protect your institution from these risks, two important adjustments to today’s lending practices should be made. First, a strengthened focus needs to be applied to correctly ascertaining the current credit quality of all new loans made, along with a simultaneous improvement in the process of applying credit risk adjusted pricing. In other words, if the institution is going to be exposing itself to increasing credit risk, it should at a minimum assure that it is being paid appropriately for taking on this incremental risk. In this manner, the institution can be protecting itself today, through increased margin, for the potential downside of increased losses in the future. In many institutions today, the loosening of credit underwriting standards means that loans graded a 3 today may have been graded a 4 (or lower) in prior times when credit underwriting standards were more rigorous. When this loosening of credit standards occurs, the institution is being underpaid for the credit risks it is currently incurring, and if economic conditions worsen over the life of the loan, this gap may widen. To address these potential problems, the institution needs to assure that a sound credit risk adjusted pricing process is applied to all new loans. Effectively this results in two loans with similar loan terms in all respects other than credit grade having some (pre-defined) basis points difference in yield. The amount of this adjustment is determined based on the institution’s experience with higher losses on lower credit quality loans, and the calculation of unadjusted ROE of each loan. The basis point difference required to equalize the ROE between these two loans is the credit risk premium, and the resulting returns may then be referred to as risk adjusted returns on capital, or RAROC, the gold standard for loan pricing. This type of pricing accuracy cannot be arrived at via judgement or simple rate sheet adjustments but requires the analytics of a fully customized and analytically appropriate loan pricing system, such as provided by ProBank Austin in its internet delivered loan pricing system LoanPricingPRO®. If you would like to discuss how you can effectively shield your institution from future credit loss shocks or would like to arrange a personalized demonstration of LoanPricingPRO® for your lending team, please feel free to contact us.